As I started to work on my first article in the new year I got stung by a word-making-bug. More on that bug little later. But this bug surely has roots in an oft-repeated word: ‘conflict of interest’ as the country prepares for a new 4-year Presidential term. But, my dear readers, be rest assured that I have no intention of writing any political commentary here. 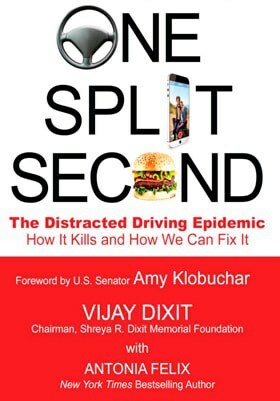 My focus and life mission is, and always will be to fight the epidemic of distracted driving. A news story caught my attention during the holidays. It was published in the Insurance Journal on November 28. The title read “Smartphone Makers Reject Obama Call for Restrictions to Curb Distracted Driving”. After reading the article, I thought it would be interesting to track reader comments that will follow. I did that for couple of months and then decided to write my feature article. The wait was worth it, and here is my take. U.S. highway safety officials called on smartphone makers to add features that would keep motorists from using functions linked to a surge in deaths due to distracted driving, a proposal that drew immediate opposition from the electronics industry. The proposed voluntary guidelines ask device makers to take steps such as blocking some video displays and preventing manual text entry while vehicles are under way. For those interested in knowing what the voluntary guidelines are go to: https://www.regulations.gov/docket?D=NHTSA-2013-0137. Initial comments to the above article were nice with readers proposing a combination of solutions that included personal accountability, stricter regulations and enforcement. There were also suggestions for collaboration among auto manufacturers and device makers. After a little while the objectivity in the online-discussion was lost. I would term it- distracted discussions. And that is when I left the scene to write my article and offer my comments. The guidelines proposed by the government are voluntary but the Consumer Technology Association chose to treat them like regulations imposed on the industry. I see the guidelines as mere suggestions for manufacturers to be careful in designing their products so they may serve their clients well without causing injuries. Industry must not be so focused on the business/profitability side of the product that it ignores the risk of encouraging improper and unsafe use of the product, driving behaviors that demonstrate over dependence on installed smartphone technologies in the vehicle. Take for instance, a recent Google car fatality in which the car took a wrong left turn and, a Tesla sliding right under a big trailer in the front killing the driver? Tesla has since redesigned the software and believes to have taken care of the problem that cased the fatality. Let me qualify myself here that I am a strong technology supporter/user, not a technology basher. I absolutely appreciate the value of technology. But, I cannot condone offering of products under the garb of so-called market based innovation which may encourage bad driving behaviors causing unnecessary loss of life. I urge the technology companies to resist the temptation of seeking market gains alone. They also need to expand their business focus, encompassing and delivering true customer value called safety. Internally directed tunnel vision of just profits that may be perceived as a conflict of interest must be avoided. Now about the sting of the word-making bug I mentioned in the beginning. It compelled me to combine Innovation and Tunnel Vision to create a new word. I call it Tunnelovation, truly a tongue twister. Ten years ago, wasn’t the now ubiquitous word distracted driving also called a tongue twister?